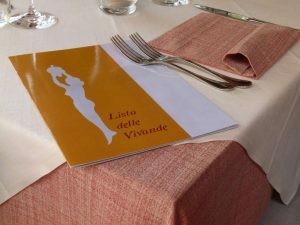 The bill of fare includes classic dishes of Piedmont cuisine / Monferrato, some dishes Italian and Mediterranean cuisine, without neglecting the fish which is inserted in the various sections of the menu. Le pasta, gnocchi and filled pasta (ravioli, full, etc) are packed with high-quality organic flour and oil used in different preparations comes from the mills selected Ligurian. The same care is used for the selection of meat fish and other raw materials. N.B. : For any information about the ALLERGENS you can see the appropriate documentation to be provided, on demand, by the staff on duty.